Clay is found in a variety of colors which include: red, green, brown, pink , yellow and even white. content that is unique to that particular clay. As a result, each type of clay offers its own health benefits for your skin which can include exfoliation, younger looking skin, the lessening of wrinkles and even treatment for skin conditions like acne.Clays are a wonderful natural , skin care benefit to our natural artisan soaps. 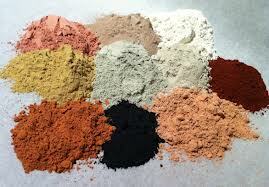 Volcanic Ash Clay -Volcanic ash clay is often used as a facial treatment at spas in Hawaii. According to Clay Essentials, volcanic ash clay has anti-inflammatory benefits for your skin. Clay Essentials also reports that the clay can help to make your skin smoother and even brighter than before. In addition, Clay Essentials also reports that volcanic ash clay can also help to remove impurities and toxins from your skin and even unclog pores. As a result, it is an excellent treatment for people that suffer from ongoing breakouts on their skin. Our soaps are all natural and handmade with lots of love and only the finest ingredients.